They say that the 3 top fears for a human being are public speaking, death and dancing in public, and it seems they are in that order. As I have worked as a Coach and consultant with many people and as a manager of teams, I can confirm that public speaking fear is indeed very threatening for many people. The reasons behind it might vary from just an introverted personality, insecurities or just the regular fear that we experience when we are trying something we are not proficient at, something new that is uncomfortable and that we may do in a clumsy way. But there is no doubt that how to present in public is a skill like any other that you can learn, practice and become comfortable doing through theory and practice. Content. In some cases, this is easy if you have a product or service to present or you have knowledge to share, in others you need to do some research, analysis or gather information. In any case the best content for you to present is that where you are an expert and where you have deep knowledge of the subject. Then if you draw from personal knowledge, experience, and life stories that content will be easy to memorize, easy to engage your audience and it will be more powerful. If you draw from something you don’t master, then duplicate your efforts to understand it and master it before presenting. Delivery. You might use a presentation tool or not, you may use some props or not. And this is one of the areas where you can learn more and get some public speaking classes and practice on various topics like voice, body language, presentations, openings, closings, etc. 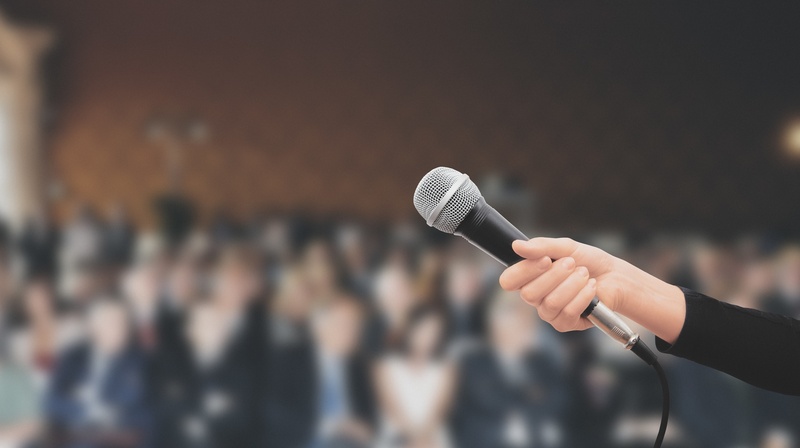 But the key point to remember is if you were the audience, if you were one of the people listening to your presentation what would be the most effective way to present? Create a powerful and useful presentation by being concise with your message, making it entertaining and even fun if possible (everybody likes to laugh) while creating a nice experience aligned to your audience. Intention. Do you want to sell? Do you want to convince? Do you want to share important data? Be clear from the planning stages of your presentation: what is your intention and how will you accomplish it better. Then while presenting make sure that your intention is clearly stated and present your points on why the audience needs to buy, be convinced or be aware of important data. Don’t forget: always to state the benefit they will get. Attitude. I once heard that it is selfish not to be a speaker. Throughout the years we all have accumulated knowledge, experience, life lessons, tips and tricks, and we have also heard about that useful new app for the iPhone. Therefore, don’t hesitate to think that you have something valuable to share. True, it might not be valuable for all of your audience, but be sure that if your content, your message, your lesson helps at least one human being to improve in his business, in her career, in his life; you are giving a great presentation. Confidence. How is your confidence? Super nervous of course, even seasoned speakers get nervous before a presentation but here are some ideas to have the right self-confidence and secure attitude that you need for a successful presentation. First think that the audience is not your enemy they want you to succeed, they don’t want a boring presentation or a bad experience they want you to be successful in providing a great experience. Also, think you are the expert, of course there are other experts in the audience and there might be someone that knows more than you about this topic, but for the majority of your audience, you know more because of the simple fact that you prepared for this. And finally imagine you are explaining this to only one person and not dozens or hundreds. Even if you don’t intend to become a professional keynote speaker, I recommend embracing this as another skill that you need to learn and to practice. No matter what your profession or industry is I have seen how useful it is for a person, in any field, to be a good presenter and how bad it is to do it carelessly without the right preparation. With some basic ideas, you can improve these 5 points over time and become a great presenter. Copyright ©2014, Impact Coaching Solutions.